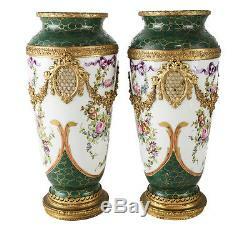 Description: A stunning pair of Sevres France hand painted porcelain and gilt bronze vases/urns, circa 1900. 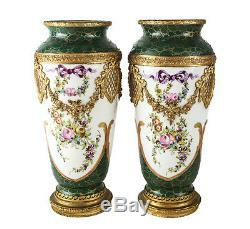 Hand painted florals to the central area of the vase with hunter green ground to the top and base rim. Gilt bronze mounts in a floral swag pattern. Marked to the underside base. Difficult to fine non idyllic Sevres pieces that are good quality, meaning that don't have of people or animals. 5.25" diameter x 10.75" height. Light wear to the paint and wear to the gilt bronze frame. Please view our selection of quality items. For sale at Gallery XV! (This item is located in Gardena). Domestic & International Customers - WELCOME! We guarantee the authenticity of all items to be as represented. We make a best effort to provide a fair and descriptive condition report. Gallery XV specializes in a variety of art, antiques, jewelry and collectibles. We possess over 100 years of experience in the industry as collectors, appraisers and resellers. Our ever expanding inventory originates from estates throughout the U. But is especially rich with Southern California estates including celebrities, historical figures and renown collectors. If you haven't seen something that interests you or that you collect, stay tuned... It's just the tip of the ice berg. We are prompt and professional with our correspondence and appreciate you taking the time to shop with us. "You are only as good as your last feedback". 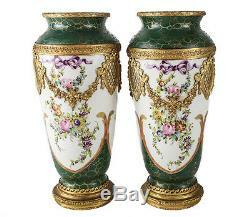 The item "Pair of Sevres France Hand Painted Porcelain & Gilt Bronze Vases/Urns, c. 1900" is in sale since Friday, July 28, 2017. 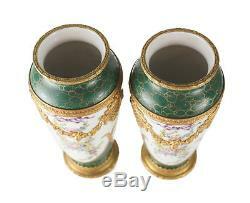 This item is in the category "Antiques\Decorative Arts\Ceramics & Porcelain\Vases". The seller is "gallery_xv" and is located in Gardena, California. This item can be shipped worldwide.